It's not easy being a pseudo-Victorian colonist on the Clockwork Empires frontier, especially when that frontier is built upon a nest of Lovecraftian horrors. Even something as simple as keeping yourself properly fed can be a tremendously complex and taxing effort. Fortunately, the Prudent Bureaucrat's Guide to Colonization is here to help you, and those around you, avoid the specter of starvation. 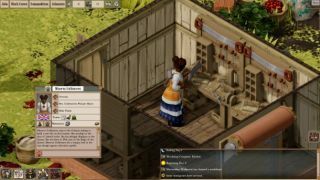 And yes, it's true: I'm writing about this mainly so I can share the new "Staving Off Starvation" trailer, which marvelously encapsulates what I hope Clockwork Empires will be: Strategic, funny and deeply, intensely weird. But it did go live on Steam Early Access today, and I think that's worth talking about; after all, our March preview describes it as "one of the most interesting games in development today," and that's pretty high praise. To find out more about Clockwork Empires, a game about steampunk colonization in a Cthulhu-esque nightmare, hit up clockworkempires.com .